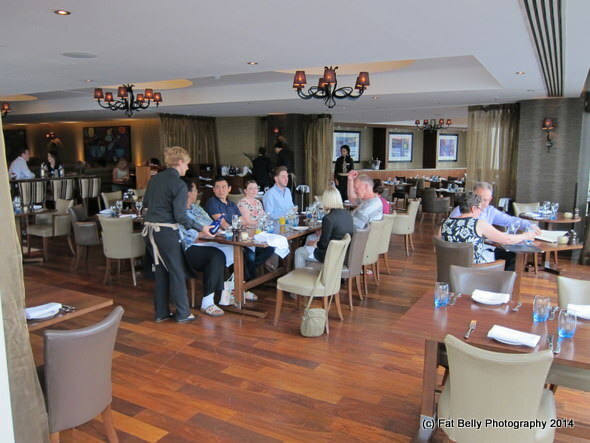 Recently I got the opportunity to visit Tempus at Tides Bar and Restaurant at The St. David’s Hotel in Cardiff Bay. Hotel restaurants trying to entice in non-residents seems to be a bit of a thing at the moment so I was keen to see what Tempus had to offer. We visited on a busy Saturday night, there were two weddings in full swing and a number of people making the most of the lovely weather to enjoy the terrace, which offers some stunning views of the bay. General Manager Andreas, welcomed us and showed us to our table, which we shared with fellow blogger Kacie of The Rare Welsh Bit and her friend Dan, along with Rob and Louise from Petersens and their respective partners. Tempus at Tides has just launched its new menu, which has been designed in conjunction with Consultant Chef Stephen Tonkin. As some of you may know Stephen had a long association with Caprice Holdings working his way through the ranks at the famous ‘The Ivy’ before becoming head and then executive chef at Dean Street Townhouse. He currently works for Des McDonald (his old boss at Caprice) Restaurants as executive chef. Stephen has been helping Dominic Powell, executive chef for St David’s design and plan the new menu. Dominic joined St David’s in 2011 as sous chef, after moving from the Park Plaza and has progressed rapidly to his current position. 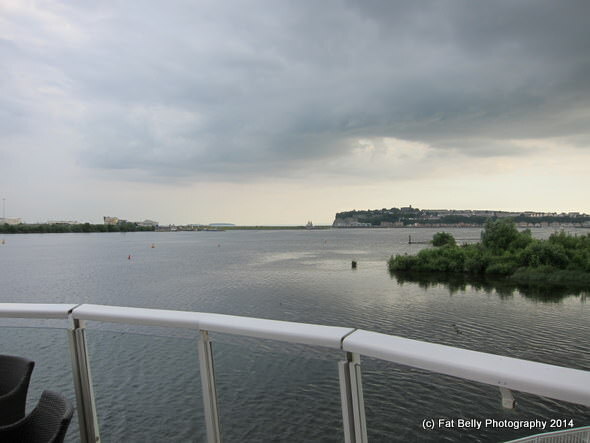 The restaurant itself is light and airy thanks to the large amount of glass looking over the terrace and eventually Cardiff Bay itself. The wooden floor, low ceiling and bustle of the adjoining bar do give it some character and so it does manage to avoid the soullessness that often afflicts hotel restaurants. Chef Dominic pops out to say hello and explain the ethos behind the new menu. Basically it’s bang on trend being fresh, locally sourced, seasonal ingredients with an emphasis on seafood (well we are slap bang on the Bay after all). I note his recommendation for the Sea Bass before beginning to study the menu. We start with the customary bread, which consists of three different types of roll; tomato, onion and parmesan. These are served with Netherend butter, olive oil and aged balsamic. The parfait was lovely and smooth, although I did feel the flavour was little muted and needed a lift. It worked well with the toasted brioche bun though and the chutney (hand made in Llangennech) did a good job of cutting through the fattiness of the parfait to give the whole thing balance. 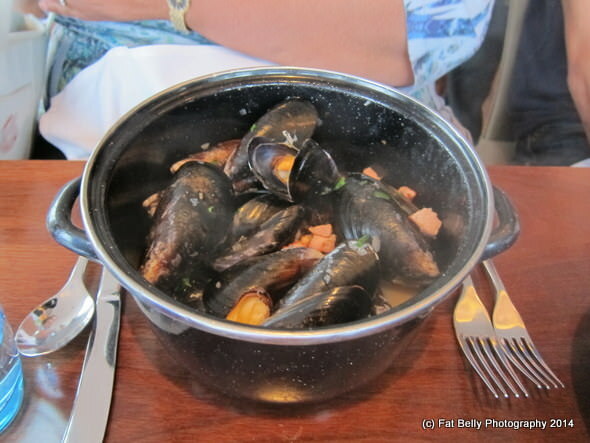 MrsA’s mussels are plump, juicy and well presented. Simply cooked, they are hard to fault without being earth shattering. For main course MrsA chooses the Catch of the Day, Hake on a Bed of Courgette and Leaves. The hake is top quality and super fresh, very well cooked. The courgettes are lightly roasted, intensifying the flavour but not to the point where it overpowers. MrsA is very happy to find a chef who can cook fish with this finesse. 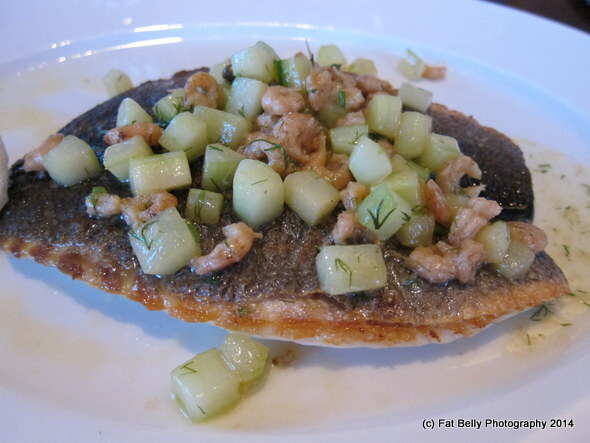 I opt for the chef’s recommended ‘Burry Port Kippered Wild Sea Bass, Cucumber & Brown Shrimps’. Landed that morning the Bass is again very fresh and arrives on my plate via chef who knows how to treat a piece of good fish. Nice and simple, nothing distracting from the delicate, yet full flavour, the cucumber, brown shrimp and a little dill serve only to enhance. I can’t think of many places that would have cooked this better. 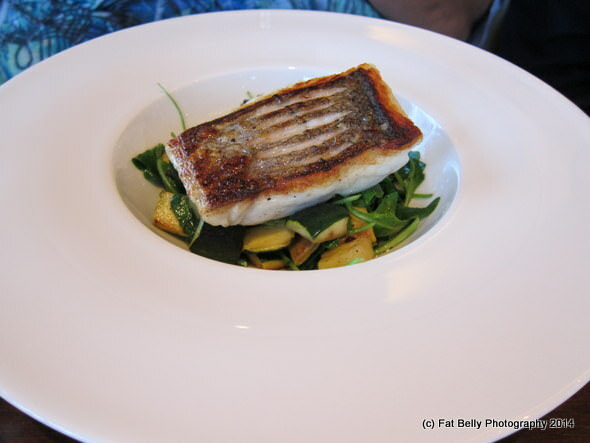 Overall top marks to Chef Powell for his fish dishes, we would certainly go back for the fish. So onto dessert, and after the high point of the main courses the dessert selection seems a little uninspired. Sticky Toffee Pud is, it seems to me, more at home in a gastro pub than the restaurant of a 5 star hotel. The Ice Cream too is bought in, albeit from a reasonable source. I wonder if the one thing that Tempus lacks is a pastry chef. The signature dessert is called After Eight and is a riff on a chocolate and mint ice cream. I decide to give this a miss and choose the simple ‘Vale of Glamorgan Strawberries, Clotted Cream’. Nowhere to hide here, this dish is totally reliant on quality ingredients and thankfully it has them. 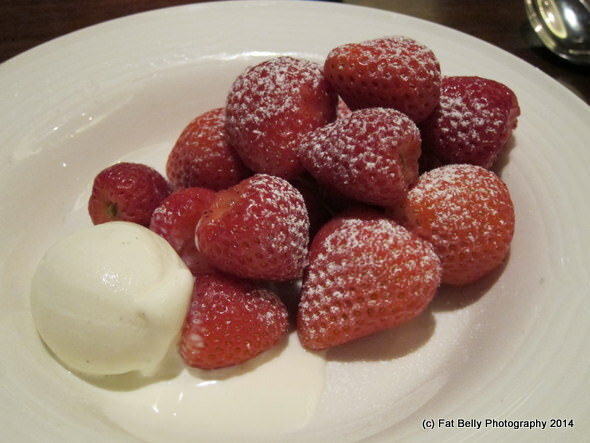 The strawberries, nicely dusted in icing sugar are sweet and flavoursome. 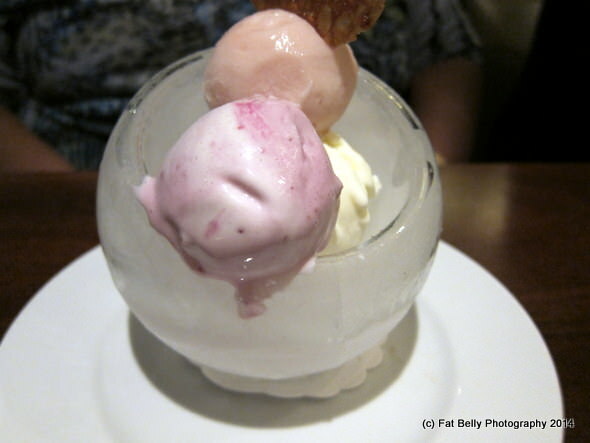 The clotted cream ice cream is rich and smooth. Good stuff. MrsA, also struggling to find something prepared in-house to tempt her, decides to try the Selection of Ice Creams. The presentation is unusual, in that the tilted glass serving bowl is itself frozen, making the dish visually interesting. Unfortunately the contents themselves are a bit more ordinary. In summary, I’m not sure how Tempus at Tides is going to fare at bringing in the non-residents, traditionally an area where most hotel restaurants struggle. Even with its Bay Side location, there’s not any easy passing trade to attract. It needs to establish itself as a destination restaurant, especially with its price point. Before it can do that, a few things, especially on the desserts, need tweaking. I’d still go back for the fish though! 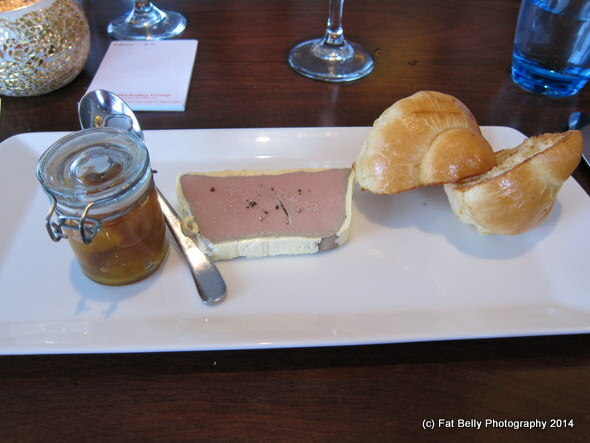 We were invited to dine at Tempus at Tides as guests of Petersen PR and as such all food and drink was complementary.